ST. GEORGE — Desert Hills High won the Region 9 boys golf title Thursday, the same day the school’s girls tennis team made a strong showing at the 4A state tournament’s opening rounds in Salt Lake City. 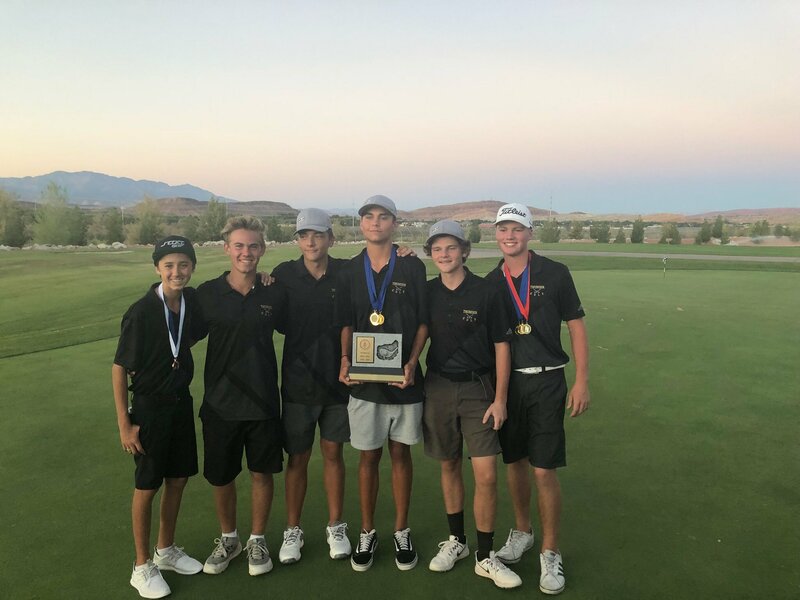 Desert Hills clinched the Region 9 boys golf championship with yet another weekly win Thursday afternoon at the SunRiver Golf Club. The Thunder posted a score of 290 to win the day’s contest, which marked the seventh and final regular-season match for the seven Region 9 schools. Desert Hills had the top two individual scores the day, with Curtis Matheson leading the way with a 68 and teammate Ashton Davison also coming in under par with a 70. Desert Hills also ended up with three of the top four individual golfers in the final season standings, with Davison earning top honors for the season, Matheson finishing second and teammate Cruz Kirchhausen placing fourth overall. In addition to Desert Hills, three other Region 9 teams qualified for the 4A state tournament, which is scheduled for Oct. 1-2 at Birch Creek Golf Course in Smithfield. Region runner-up Dixie, third-place Pine View and fourth-place Hurricane will join Desert Hills as the teams representing Region 9 at the state tournament. In addition, three top golfers from teams that didn’t qualify for state are also eligible to compete at state as individuals. They are Jackson Miller and Keenan Togisala of Cedar High and Luke Walton of Snow Canyon. Tuesday evening at Cedar High, the Snow Canyon Lady Warriors defeated the Lady Reds, 3-1. Cedar narrowly won the first game 27-25, but Snow Canyon rallied to win the next three, 25-19, 25-17, 25-20. Hallie Remund and Katie Langford of Snow Canyon combined for 23 kills, with no errors, SCHS coach Dave Johnston said. Lizzie Rowland led the Warriors with 27 assists. Also Tuesday, the Hurricane Tigers came back from a 0-2 deficit to defeat Pine View at Pine View. The Lady Panthers won the first two games by scores of 25-23 and 25-21, but Hurricane came back to win three in a row and capture the match, 25-14, 25-19, and 15-12. The Lady Tigers were led by McKena Carter’s 20 kills. Fellow senior Amanda Phillips had 33 digs, and London Gubler added 25 digs and 13 kills. Alexis Martin, also a senior, had 32 assists. Pine View, meanwhile, was led by Ellie Wilson’s nine kills. Also on Tuesday, Dixie hosted Canyon View, with the Lady Flyers defeating the Falcons in three sets, 25-12, 25-23, and 25-19. 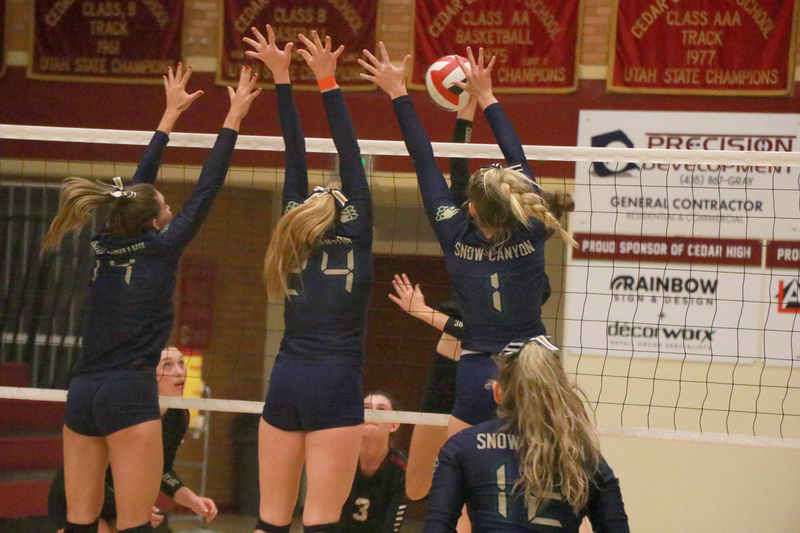 Thursday evening, Snow Canyon hosted Pine View and defeated the Panthers in three sets, 26-22, 28-26, and 26-20. Sammi Johnston led the Warriors with 21 kills, Emilie Leavitt hit 55.6 percent of her shots with no errors and Halle Remund added 13 digs and five blocks. Also Thursday, Desert Hills hosted Cedar, with the Lady Thunder picking up a 3-1 win. Desert Hills won the first set easily, 25-8, but the next two sets were close, with Desert Hills winning the second one 25-21 and Cedar taking the third by the same score. The fourth set was also close, but the Thunder prevailed, 27-25. Kami Bliss led Desert Hills with 21 kills. Dixie traveled to Hurricane on Thursday and picked up a 3-0 sweep of the Lady Tigers. The Flyers won the three sets 25-14, 25-18, and 25-23. Tuesday at Hurricane, the Snow Canyon Lady Warriors defeated the Tigers 3-1, with Ashley Brindley, MacKenzee Brough and Tylei Jensen each scoring one goal for Snow Canyon and Madelyn Hatch netting Hurricane’s only goal. The other two Region 9 games on Tuesday were both shutouts. Dixie picked up a 4-0 win at home against Cedar, with Kennedy Warnick scoring a three-goal hat trick. In addition, Desert Hills hosted Canyon View and defeated the Falcons 6-0. 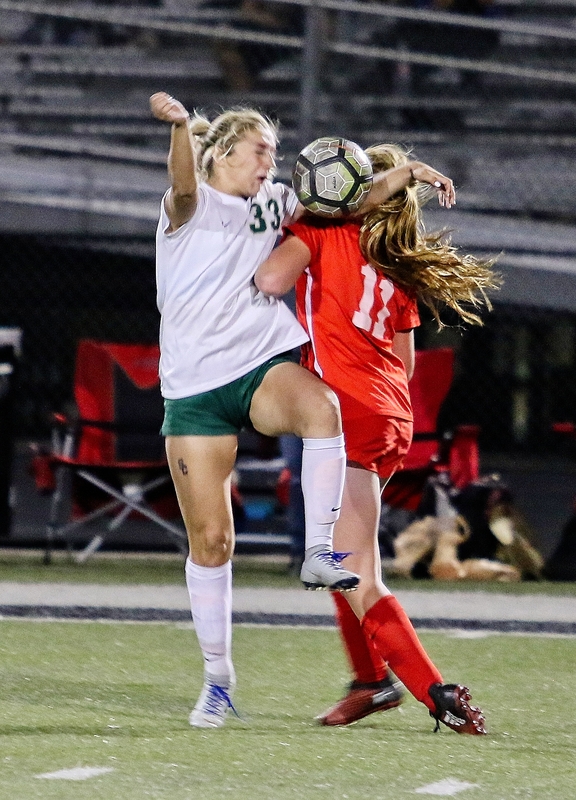 Kiki Stewart scored three goals for the Lady Thunder, and goalkeeper Mikenna DeCastro picked up the shutout. In Thursday afternoon’s action, Cedar edged past Canyon View 4-3 at Cedar High, with Logann Laws scoring all four of the Lady Reds’ goals in the come-from-behind win. The Falcons, who led 2-1 at halftime, got two goals from Morgan Haag. Also on Thursday, Snow Canyon hosted Desert Hills and defeated the Lady Thunder, 5-2. The Warriors led 3-0 at halftime. Adi Melendez scored twice for Snow Canyon. At home on Thursday, Dixie defeated Pine View 2-1, with Kelcee Call and Isabel Erickson each scoring a goal for the Lady Flyers. Cedar High School is hosting the Cedar High Invitational Friday evening, with the girls varsity race scheduled to start at 5 p.m. and the boys varsity race at 5:30 p.m. Snow Canyon will also host an invitational meet Oct. 4. The Region 9 championships will be at Sand Hollow on Oct. 9. As reported previously by St. George News, Desert Hills went undefeated on Thursday’s opening day of the state 4A championship at Salt Lake City’s Liberty Park. After a one day break Friday, the 4A tournament will wrap up with the semifinals and finals on Saturday. Two of Friday night’s three Region 9 games are in Cedar City, with the Cedar Redmen hosting the Hurricane Tigers at 7 p.m. Both teams are looking for their first region win. Meanwhile, Canyon View will host the Desert Hills Thunder for the Falcons’ homecoming game, also at 7 p.m. The Thunder are 3-0 in region play, while the Falcons are 2-1 and riding a two-game winning streak, having beaten Cedar and Hurricane on the road the past two weeks. In the only St. George area game Friday night, Dixie Flyers will host the Pine View Panthers at 7 p.m. Both teams are 2-0 in region play. Check back on St. George News / Cedar City News following Friday night’s games for scores, photos, highlights, summaries and other details.